British Provinces Western Portion (Canada). British Provinces Eastern Portion (Canada). 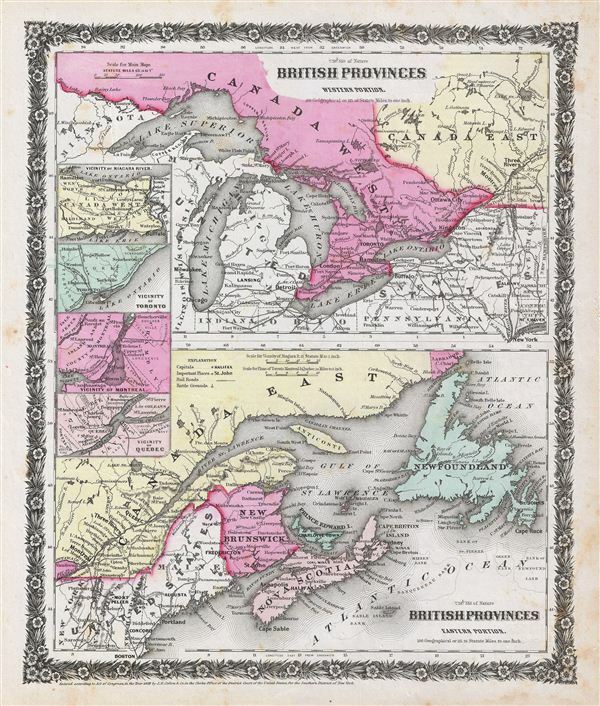 A rare example of Colton's 1858 map of the western and eastern portions of the British Provinces (Canada). Divided into two maps, the upper map covers Canada West and part of Canada east including the Great Lakes of Superior, Huron, Michigan, erie and Ontario. The lower map coves Canada east and the Canadian provinces of New Brunswick, Nova Scotia, Newfoundland and Prince edward Island. Four insets along the left margin detail the vicinity of Niagara River, vicinity of Toronto, vicinity of Montreal and vicinity of Quebec. This beautiful hand colored map is a copper plate engraving, featuring a delicate floral style border only used by Colton in this particular atlas. It offers fine detail throughout with elevation rendered by hachure. Divided and color coded according to provinces, shows major towns and cities, railroads as well as geological features such as lakes and rivers. This map's detailing of the five lakes recalls the Canadian American Reciprocity Treaty, in effect from 1854 to 1865. The Treaty was a move towards free trade, in which the United States and Canada opened borders and shared navigation rights. Dated and copyrighted to J. H. Colton, 1859, this map is by G. Woolworth Colton and the text is by Richard Swainson Fisher. Published from Colton's 172 William Street Office in New York City an issued as part of the1859 edition of Colton's Illustrated Cabinet Atlas and Descriptive Geography.